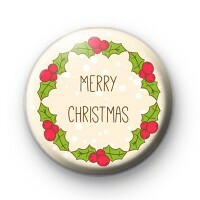 This is a listing for a 1 inch button badge with Merry Christmas written in the centre of a holly wreath. It is a lovely classic festive design and would look great pinned to your coat this Christmas or as a handmade addition to Christmas cards or as a party favours. We have over 600 Xmas themed badges in the shop so make sure you check them out too.